Motorcycle tyres all look black and round, but you wouldn’t believe how much difference there is between tyre genres. For many the sheer choice of rubber out there is bewildering. It’s not helped by the fact that just about any tyre on any bike will feel kind of ok, even if it’s the wrong one. 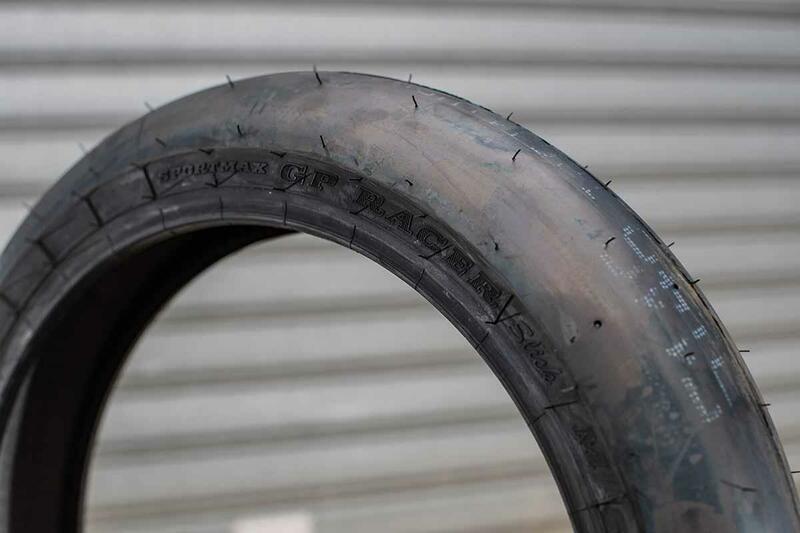 Lots of riders stick to the tyre they and their friends like, but they could be missing out, because choosing the right type of tyre is essential to getting the most out of your bike and riding. There are basically three types of tyre for the road: sports, sports touring and fast road/track. Then there are another two for the circuit: trackday and racing. On the face of it choosing the right rubber seems easy, but what really is the best tyre for you and what happens if you choose the wrong one? To find out we’ve gathered all five genres of 17” rubber from a single manufacturer: Dunlop and we’ll put them through a number of scientific tests at their Mireval facility in the south of France. These tyre categories are indicative of what’s available from Dunlop and most other leading manufacturers. A low speed, second gear (on tickover) figure of eight course will reveal how each tyre affects steering effort, a wet handling course unlocks what happens when the heavens open and high-speed track work will uncover a tyre’s potential at the limit. I’m learning the track as the day progresses and my lap times naturally get faster, so we’ve included the times of Dunlop’s test rider, who knows the track’s every stone and tyre’s behaviour as a gauge. 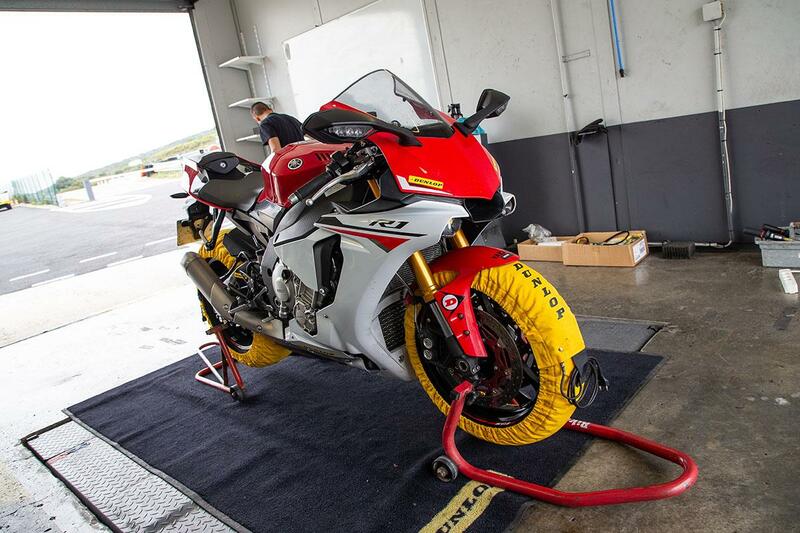 We’re using a Yamaha R1 as our testing instrument, which will give us consistent results throughout our test. Electronics are turned down, or off, so awe don’t mask tyre behaviour. Brakes: Race pads, braided lines with ABS connected. Tyre highlights: Wear-resistant, rain-friendly multi-compound designed. Big grooves for water dispersion. Sports touring tyres have evolved to the point where they’re as happy on trackdays as they are touring, in all weathers, all year round. They’re durable and stable, but that comes at the expense of a lack of outright grip and sportiness. At low speed: As soon as they start rolling these tyres are ready to go. They give instant confidence, letting you steer the bike with pushbike-light ease and keeping on line with the lightest of touches on the bars. These are characters that will suit almost every riding condition on the road from sub-zero to sunny temperatures. At high speed: Sports touring tyres aren’t designed for the track, but they actually perform very well. These Dunlops are used by the Honda Ron Haslam Race School on everything from CBR125s to Blade SPs. Front grip and steering accuracy isn’t too different to the sports tyre, but the rear has significantly less side grip, although there’s plenty of feel for when it lets go. For road riding grip won’t be a problem, but for crisper steering and lighter handling sportier tyres are the ones to go for. In the wet: As you’d expect, sport touring rubber is the best in the wet. Compared to all the other tyres here it’s almost like riding in the dry thanks to the amount of grip and confidence they give under braking, acceleration and lean angle. Best for bikes: Nakeds, super nakeds, sportsbikes, tourers, sports tourers, sports adventure and pure adventure bikes. Most suited type of rider: Year-round commuting, all-weather riding, touring fan. Riding type: 99% road-based, but will handle a gentle trackday. Tyre highlights: Silica-rich multi-compound for wet performance and sporty profiles for easy steering. 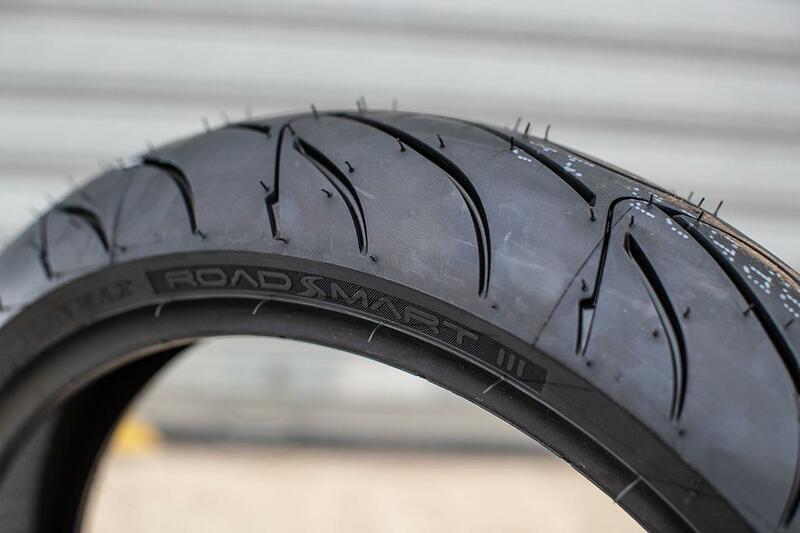 Lighter, gripper and quicker steering than sports touring tyres these are designed for more fair-weather riding and occasional trackday use, but still won’t let you down when you get caught in bad weather. At low speed: These have the same neutral steering character as the sports touring tyres, but take a few moments longer to come up to temperature, but there isn’t much in it. They give our R1 test bike a lighter, more agile and you’ve guess it, ‘sportier’ feel at the bars. At high speed: Sports tyres are generally lighter than sports touring tyres (they don’t have such a meaty layer of long-life rubber) and more rounded profiles for quicker steering. The R1 is easier to flick through corners and the front has impressive grip. It’s still easy to unhook the rear with the first tap of throttle, but once you’re driving the rear tyre digs in hard. In the wet: Again, these sports tyres have a similar feel to their touring counterparts in the wet. Ultimate grip and confidence isn’t quite as high, but they don’t spring any surprises or heart in the mouth moments. Best for bikes: Nakeds, super nakeds, sportsbikes, superbikes and sports adventure bikes. Most suited type of rider: The more spirited, sporty rider. Riding type: A and B road blasting and the occasional trackday. Tyre highlights: Front construction and profile identical to racing tyre. Limited grooves for maximum dry grip. At low speed: The first stage of our test with these tyres sets the scene and show how this genre of tyre manage to combine the best bits of road and track tyres. They’re neutral handling, but now the steering starts to feel on the heavy side compared to the sports touring tyres. 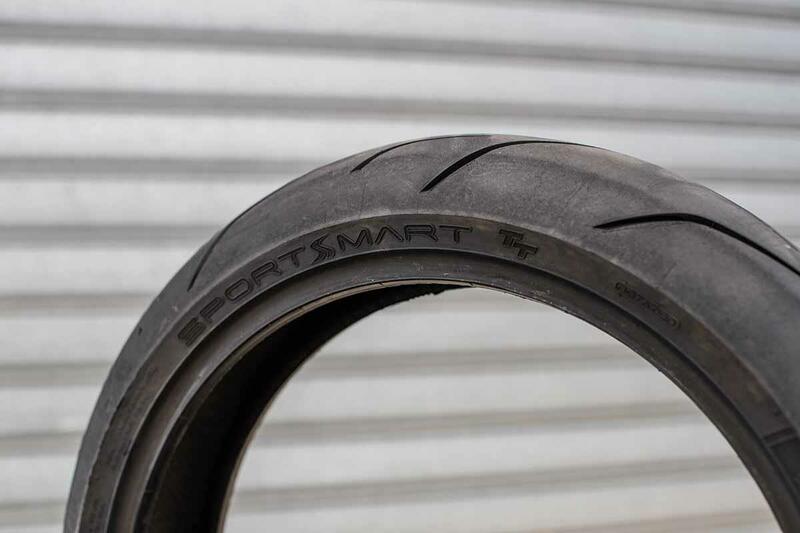 At high speed: Where the sports and sport touring rubber have similar characters, save for rear grip, now performance leaps up a level, knocking on the door of pukka trackday tyres. No tyre warmers are needed, but after a lap they’re good to go. Front grip and turning is sublime and you have to be ultra aggressive on the throttle at full lean to get the rear to move. In the wet: You’d never believe a 50/50 road/track tyre would be so capable in the wet, but it is. It’s one of the surprises of the test. In fact some Dunlop endurance teams use the TT as a racing intermediate in drying track conditions, which shows its true versatility. Best for bikes: Fast nakeds, super nakeds, sports and superbikes. Tyre highlights: Race-derived construction, multi-compounds and profile. NTEC rear allows low track pressures for maximum grip and stability. 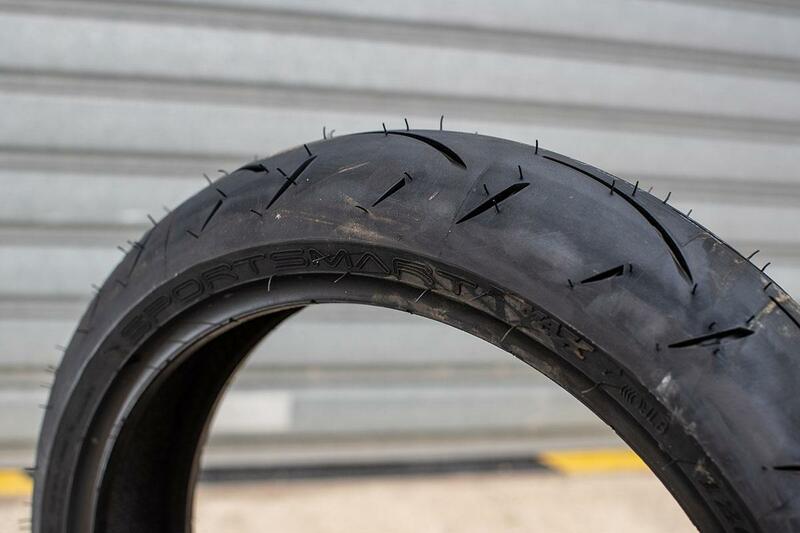 Unlike racing rubber, trackday tyres don’t need tyre warmers to work, won’t suffer from heat cycle degeneration and operate in a wide track temperature window. Like these Dunlops many are available in treaded or slick versions. At low speed: Although these are still road tyres (the treaded versions, obviously) and don’t need tyre warmers for use, these have harder, endurance racing-type compounds and take longer to come up to temperature. Bars need a firmer input to keep the Yamaha on course to stop it sitting up and going straight on. At high speed: Loaded with the grippy character of the fast road/track tyre, these let you corner that bit faster, beg you to let go of the brake earlier to rush in quicker and get on the throttle harder. Unlike race rubber these genre of tyres work in a wide track temperature window and don’t degrade through continual heat cycles. In the wet: Slicks on a wet track is a recipe for disaster, but treaded road compound trackday tyres will be ok in the wet at slow speed, but don’t generate the heat to give you the grip of more road-focussed rubber. Riding type: UK and European trackdays. Tyre highlights: Different compound options to suit track temperature, conditions and race length. Require a high tyre temperature to work correctly. Racing tyres operate in such a narrow window they only make sense for competition on a racing bike. They need tyre warmers to work properly and the heat kept in them in use and will tear to shreds if you use the wrong compound. At low speed: This test demonstrates perfectly why race tyres are pointless on the road. Without the heat they need to work properly all our R1 wants to do is sit up straight and it takes a big effort to keep it on line around the figure of eight. 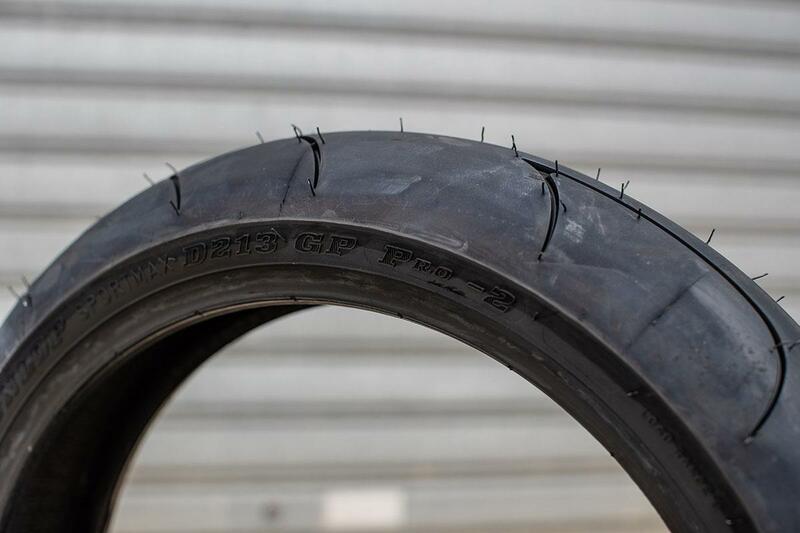 Unless you can ride hard enough to keep temperature in tyre-warmed competition rubber, they’ll be worse than road tyres on the street in every way. Fitting race scrubs might look cool, but they’ll never work as well as you think. At high speed: For just a second, or so, improvement over trackday rubber, race tyres are finicky beasts to manage. They need tyre warmers to work properly and to be able to set the correct pressure. Unless you choose the right compound for the track temperature they’ll tear and degrade badly through heat cycles, so not the best choice for trackdays. They’re too good for a road bike on road suspension, so you can’t get the best out of them. Only a professional racer will ever get close to the exploiting the grip they offer. In the wet: Forget it. Best for bikes: Fully-prepared race machine. What have you done wrong today? You ask/You answer: What are the best tyres?